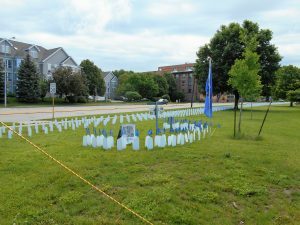 Here is a view of a portion of the 7,000 markers installed by the Vets For Peace Clarence Kailin Madison Chapter 25 along Momona Dr. that represent American Service Members killed in Iraq and Afghanistan. 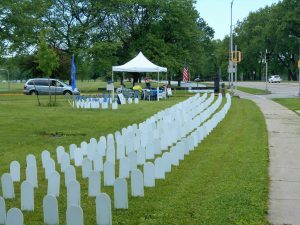 A separate installation is shown here in the semi-circle formation next to the tent that represented the over 130 Wisconsin service members killed in Iraq and Afghanistan from 2003 -2015. Featured were their Names Pictures Home Town and Unit of the individual. Many citizens stopped to make donations and to share memories. Thanks to members and volunteers who helped to install this annual project in about 2+ hours and then taking it down 7 days later. Photo by Barb Glassel.